Not to say that we had a totally quiet morning: to hopefully make himself feel better, he ended up downing some energy drink packaged in a pink bottle that made him feel a bit jittery and wired, which was somewhat comical. None of us had any idea of what was in the drink but it had 47 of something and 25 of something else so it must have been good, right? It seemed to make him feel better, even if he was bouncing off the walls. We didn’t worry about him much, though, as we all kept saying, “Trust him, he’s a doctor,” because he is (of medicine, even). 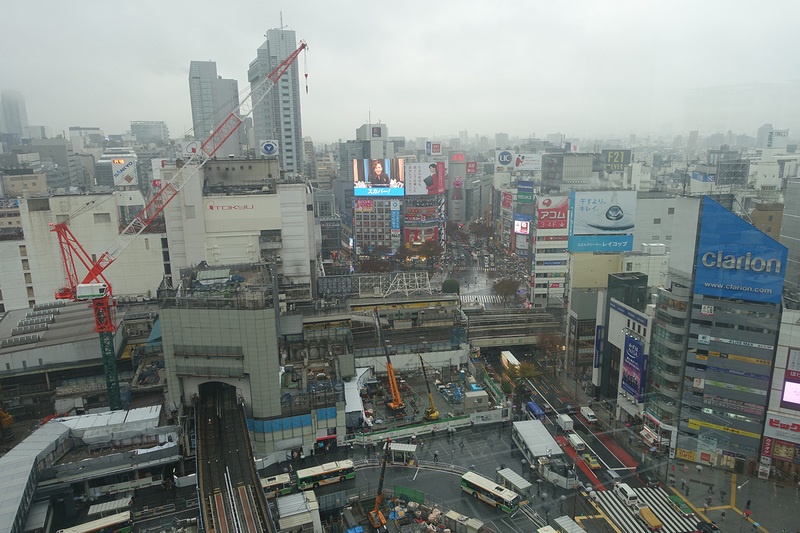 It started to rain hard while we were at the station so we tried to stay indoors as much as possible, going back to get a last bird’s eye view of the city. We grabbed some food at a basement food hall and headed back to the apartment to dry off and rest a little before heading out again in the evening. We decided to visit the 109 Mens store, which is apparently where the young trendy people go. 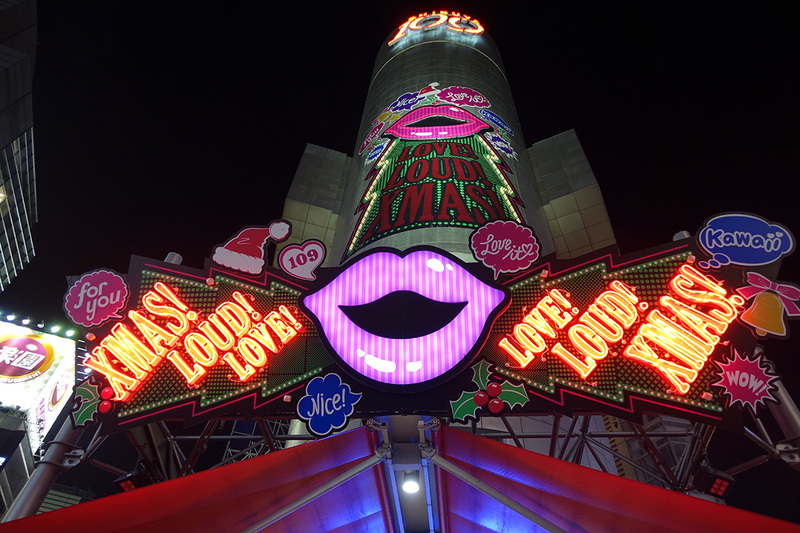 Here is a shot of the main 109 store all decked out for Christmas in its own way. Across the scramble was the 109 Mens store, which oddly had a big pink Hello Kitty display at the entrance. After that, though, it seemed to be a men’s store. 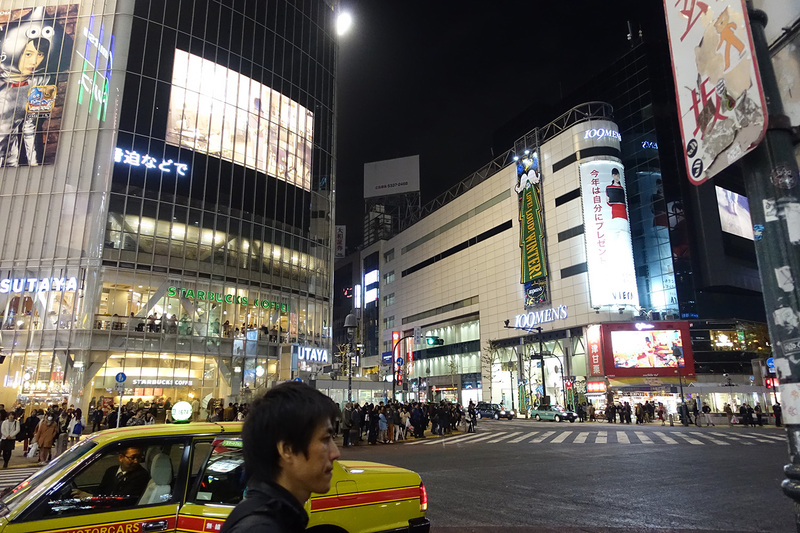 Since the yen is so weak against the dollar and we could have the 8% tax waived for purchases over ¥10K, we decided to check out the Shibuya Apple Store and Labi to see what electronics prices were. 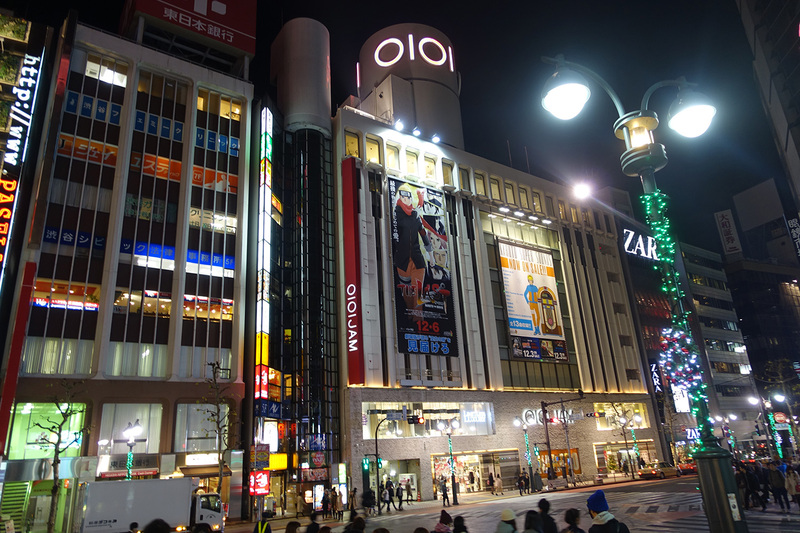 We got some ideas for things we may want to bring back but we don’t want to lug everything to Kyoto and back to Tokyo again so we’ll make our purchases later. 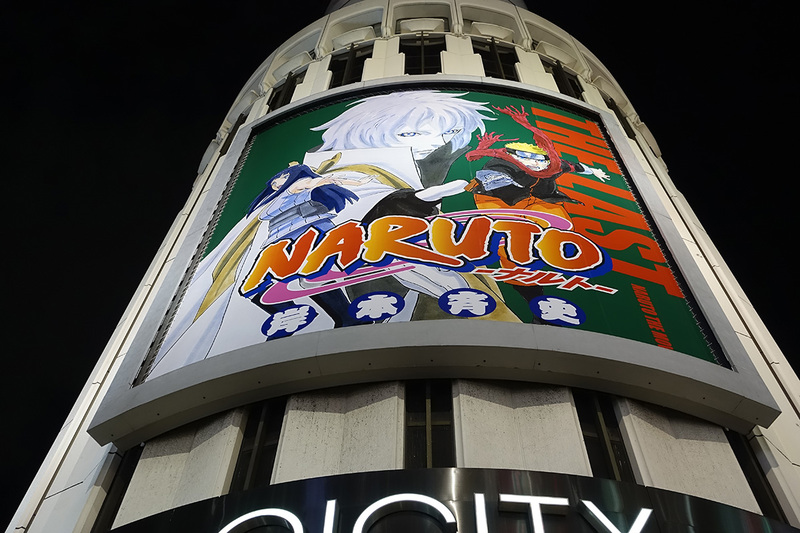 In anime news, the latest Naruto movie The Last was being heavily advertised by the Marui stores. The branch across the street had even more advertisements. My fellow anime-loving friend on this trip introduced me to Naruto and I’m slowly making my way through the series. I was unimpressed by the first 3 episodes when I tried watching a few years ago but he made me stick with it and it’s decent, actually. I’ll admit I’m more of a Bleach fan (except for Rukia – her best role was as a MacGuffin in the Soul Society arc than as a participating character, imho) but Naruto is ok. The manga ended only a month ago after 15 years (no spoilers, please!) and I hope the story was wrapped up nicely. I’ll be sure to take a look…eventually. 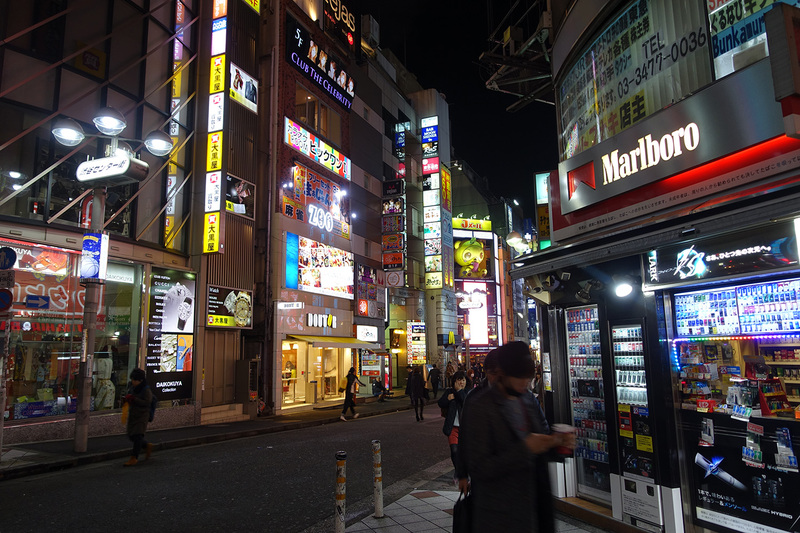 There’s a lot to see in this scene and I had to capture that, yes, cigarette vending machines really do exist here. So do smoking cars on the shinkansen and smoking sections in restaurants. It’s a bit different from California. 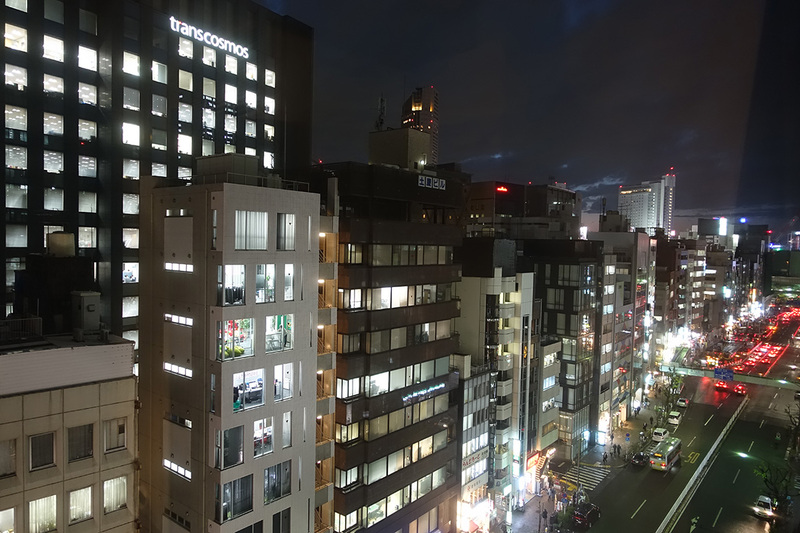 I’ll leave you with a view from the apartment in which we stayed in Shibuya. We were very fortunate in its great location and how nice everything was! Our trip to Kyoto commences on Day 7 and I’ll have lots of pictures to share so stay tuned for the next post.